Murad, a brand you won’t have seen on Manface before (for absolutely no reason I hasten to add) have two products; two magical products; two products that will fix your body acne right up and I tell you this here and now with my absolute professional authority… They. Work. These products are the Murad Blemish Control Body Wash and Murad Clarifying Body Spray. The first step in the 2 step system. This lightly foaming body wash features a 1% concentration of salicylic acid, a chemical exfoliant that gently but very effectively breaks down the bonds of surface dead skin cells. Date Seed Powder works as a microdermabrasive exfoliant to physically buff away dead skin cells. Remember, the body can take, and usually needs, a much deeper and multi-levelled approach to exfoliation. When it comes to the face, I wouldn’t particularly recommend a chemical and physical scrub at the same time. Once pores on the body are unblocked and the dead skin cells are removed, Green Tea and Liquorice Root Extract condition the skin by calming the surface, reducing irritation and really calming redness. Many bodily outbreaks don’t form yellow heads so this is just the ticket for that red rash appearance (do make sure it is actually body blemishes and not anything more serious). Well, it feels fabulous and your skin feels so much softer to the touch after you’ve dried off. The box says to apply to wet skin but I really disagree; instead, apply product into the palm of your hands, wet your hands, and then start to massage in. I found that applying it to wet skin caused the Blemish Control Body Wash to slip off, not foaming much and seeming nowhere near as effective. So there you go, a top tip to take away. The Blemish Control Body Wash is excellent but this is where the magic really happens. With a 360 degree nozzle, you can apply it to your own back, for example, with far greater ease and efficacy. The featured ingredients are the two powerful chemical exfoliants, Retinol and Salicylic Acid. These really get to work by unblocking the pores, causing the p.Acne bacteria (spot causing bacteria) to oxidise, wither and die. Clinique used to do a similar product a good few years back (about 5 years I think) which I found really effective but in comparison to this, Clinique’s wasn’t anywhere near the mark and you’ll know it’s not often I say things like that. Apply the Clarifying Body Spray to clean, dry skin. When you apply, you won’t particularly feel anything as the mist is very fine making it easy to go a little overboard; you will get used to it though. As I say, you don’t really feel it doing anything… until around 30 seconds later. This is where the fun starts – prepare for the most mentholated tingle of your life. N.B. If you apply this on your backside, it’s a very interesting feeling indeed; if you get it anywhere intimate, I suggest rinsing it off but I’m sure you’ll make that decision on your own (and quite immediately I should say). The treatment dries after around 5 minutes and is best applied 3 times a day if possible. I’ve been using it morning and night and found that to be plenty. I’ve been keeping the sprayed area exposed as I carry on getting ready and found it dries before i know it. Do lower usage if you find the skin is starting to dry or becoming a little irritated; this is a potent product. Oh and just to get this in here, it doesn’t stain clothes or fabrics. Me and my friend were sat talking about the two products as I’d also let him try them out. Now, he’s a hell of a hairy Mary and after doing a course of IPL on him (I’ll be covering that this weekend) he was a bit spotty in the areas treated, mainly his back. We were both unbelievably impressed by how effective they were and between us, tested the Blemish Control Body Wash and Clarifying Spray in all the areas you’d want to treat most bodily outbreaks. I’d been using the products the longest and have found my concerns have almost cleared up after only 2 weeks use. Is there a downside? The products aren’t all that cheap. The Blemish Control Body Wash will last for ages and mine is hardly touched, but the Clarifying Body Spray has become considerably lighter (you unfortunately can’t tell how much you’ve actually used) but many reviewers online say they get around 1 month out of a bottle of Clarifying Spray and I’m tempted to agree. Actually, whilst trawling the internet for research, 99% of reviews I came across for these products were hugely positively. Some customers left really heartwarming and sometimes quite emotional reviews of how these products, particularly the Clarifying Body Spray, have really improved their self-esteem. Here are a few other tips you can implement to further help treat body spots: always use a clean towel; keep underwear fairly loose fitting; shower after sweating as sweat is a huge catalyst; pat the skin dry rather than rub it raw and don’t pop/pick unless it’s someone else doing a professional manual extraction. These products work. They work, work, work and I’m yet to be as impressed by other brands with the performance of a cosmetic product in treating dermatological concerns of the body. It’s a real shame that you can’t get these on prescription because I know for a fact that such a simple and quick process would restore body confidence in so many guys, particularly teenagers who are the most prevalent sufferers of this concern. 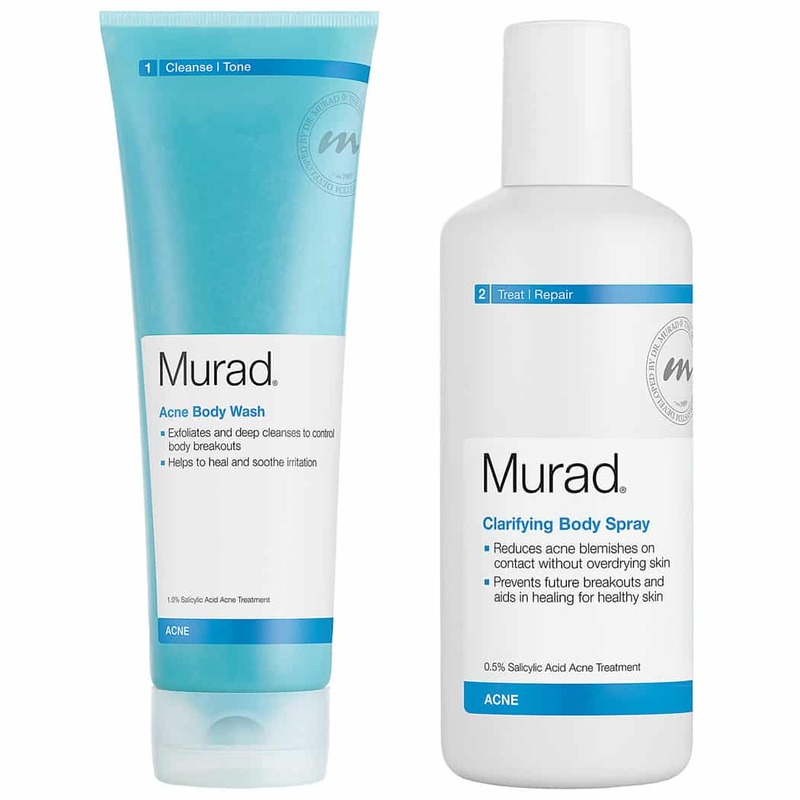 The Murad Blemish Control Body Wash is available for £38 here and the Murad Clarifying Body Spray is available for £35 here. Also, at the moment, you can get free delivery on all purchases direct from Murad. This article first appeared on MANFACE written by Thom Watson. It was published on Friday 18th October 2013 and was last updated on Monday 3rd April 2017 at 3:25pm. It's categorised under Acne, spots & blemishes, Body, Cleanse, Exfoliate, Murad, Treatment where you'll find more related content. Super review Thom! I have seen these products in the past, especially the body wash but the price does put me off. I will definitely be doing some price searches on these now.